Have a sore shoulder? Or maybe as a runner, your knee has started to bother you out of the blue, and you just don’t know why? Or maybe it’s that back or neck that just won’t get better? As a physical therapist, I deal with these problems all of the time, and I know how frustrating these aches and pains can be. They can really set us back and prevent us from doing what we enjoy most. However, I am a firm believer in the benefits of strength training and how it relates to pain. Simply put, people hurt less (and reduce the risk of these injuries in the first place) by moving more and improving/maintaining muscle strength. Even the most active among us (most often times ,the avid runner) have muscle weaknesses that need to be addressed. 1. Shoulder rotator cuff muscles: our rotator cuff is super important for the overall function of our shoulder. A weak or torn rotator cuff leads to shoulder pain, called impingement, and in extreme cases, outright disability of the shoulder. 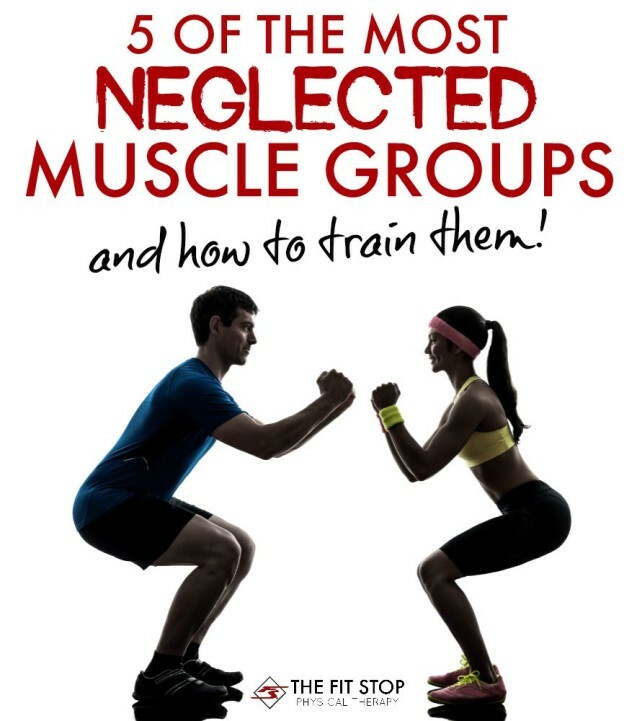 Oftentimes people (especially in the gym) will train every muscle around the shoulder (the deltoids, trapezius, and pecs), but neglect this all-important muscle. In order for your shoulder to function properly you simply have to train your rotator cuff. How To Train It: Sidelying Dumbbell External Rotation: Lay on your side and hold a dumbbell as shown. Keep your elbow bent to 90 degrees and, with your elbow at your side, rotate the dumbbell up towards the ceiling. Slowly return to starting position. 3×20 reps, 2-4 pounds, 2-3 times per week. 2. Upper back muscles: I think this muscle group is one of the most-often overlooked. Unfortunately, it’s also one of the most important. These muscles, when weak, can contribute to pain or problems in multiple joints, such as the shoulders, neck and mid back itself. How To Train It: I’s T’s and Y’s. Lying face down with one arm hanging over the edge of your bed or a high table, move your arm back, to the side and forward at an angle, (as in making a I, T, and Y with your arms). 2 sets of 10 reps, between 2-4 pounds, 2-3 times per week. 3. Hips: Having weakness in the hip muscles that rotate and move the legs out to the side can lead to problems in multiple joints: back, hips themselves and knees. In fact one of the primary areas that we look when treating lower back pain is hip muscle strength. They’re a vital “core” muscle and you need to be training them regularly. How To Train It: Resisted hip abduction: You can use an ankle weight or a standing machine for this one; oftentimes even the weight of your leg can offer sufficient resistance. Stand upright with good posture. Use the muscles on the side of your hip/leg to pull your leg out to the side. Slowly return to the starting position. 3×12 reps, 2-3 times per week. 4. Deep abdominals: Of the all important core muscles we have, the deepest layer of our abdominals is the one that is most-often neglected. When treating back pain as a physical therapist, specific abdominal strengthening almost always needs to be included to help overcome the debilitating effects of spine pain. We’re not talking the “six-pack” rectus abdominis muscle that people tend to train ad nauseum. No – when thinking function we need to get a little deeper! How To Train It: Side planks: Lay on the floor on your side. Prop op onto one elbow and the outside of your foot as shown. Try to keep your body alignment straight head-to-toe. Start with 10 sec holds and work your way up to as long as 60 seconds, 2-3 sets, 2-3 times per week. 5. Legs: I think the legs in general get neglected, especially as we age. Weak leg muscles can lead to knee pain and also be a major contributor to falls in the elderly. Having weak leg muscles can also be linked to creating too much stress and strain on that low back. In order to bend over and lift something off the floor, you need strong legs! How To Train It: Leg exercise to add to your routine: the squat: Stand with your feet shoulder-width apart. Keep your head up and your chest high as you drop your buttocks down towards the floor (as in sitting down in a chair). Drop as low as you can go (knees to 90 degrees, thighs parallel to the floor) and use the muscles in your legs and hips to pull yourself back up to standing. So if you haven’t done these exercises in a while or if they seem a little bit foreign to you, then it is time to mix it up a bit. Back off a bit on that bench press or dumbbell curl, and give a little love to these oft forgotten muscles. Remember that these are general recommendations, and depending on your fitness level, age or medical history, you may need to modify these exercises slightly at the beginning. Of course you can always check with your physical therapist at the Fit Stop if you have any questions or concerns about adding these exercises to your routine. Working these simple movements into your routine today will make your exercise routine more comprehensive, and I believe will go a long way towards preventing injuries in the future. What is a pulled muscle and what can I do for it? How much physical activity do I need?